During the 1995 and 1996 school year, I had lent my tuba to my friend Kelly Dybas. Kelly wanted to learn to play the horn, but her school did not have an instrument to play. So twice a week her mother, Linda Dybas, would stop by to pick the horn up and twice a week she would bring it back so I could go to rehearsal. The Brethren School Band got to tour Hawaii and all I got was this lovely picture (well she also brought me back a tee shirt, macadamia nuts and a bottle of sand but who's counting). 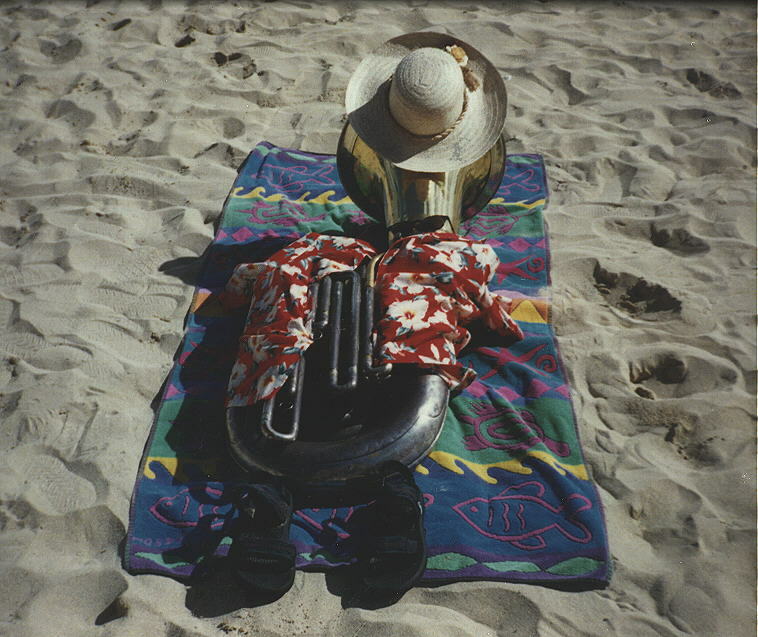 So anyway here is my tuba relaxing on the beach at Waikiki! BTW, this year Kelly decided to wimp out and play the flute! She'll play it well too. ©Web Connections, 1995. The Web Connections logo is a trademark of Web Connections. All other trademarks are the property of their respective owners.